Our Father, who art in heaven, hallowed be thy name; Thy kingdom come, thy will be done, on earth, as it is in heaven. Hail Mary, full of grace, Our Lord is with you. Blessed are you amongst women, and blessed is the fruit of thy womb, Jesus. 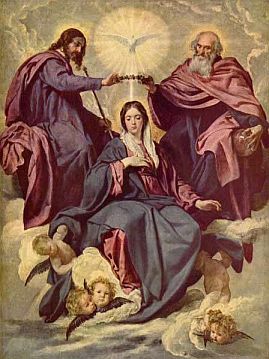 Hail, Holy Queen, Mother of Mercy, hail, our life, our sweetness and our hope. To thee do we cry, poor banished children of Eve, to thee do we send up our sighs, mourning and weeping in this vale of tears. Turn, then, most gracious Advocate, thine eyes of mercy toward us, and after this our exile, show unto us the blessed fruit of thy womb, Jesus; O clement, O loving, O sweet virgin Mary. Say one Our Father, ten Hail Marys while meditating on the mystery and end with the Glory Be.